At Compass Truck & Tire you will find a wide choice of tire brand name tires, which enables us to offer a style and price designed to fit your budget. Properly maintained tires improve the steering, stopping, traction and load carrying capability of your vehicle. Under inflated tires and overloaded vehicles are a major cause of tire failure. To avoid flat tires and other types of failure, you should maintain proper tire pressure, observe tire and vehicle load limits, avoid road hazards and regularly inspect ALL of your tires. Both placards and certification labels are permanently attached to the vehicle door edge, door post, glove box door or inside the trunk lid and of course in the owners manual for your vehicle. 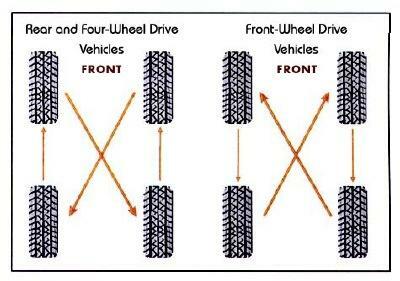 Rotating tires from front to back and from side to side can reduce irregular wear. Look in your owner's manual for information on how frequently the tires on your vehicle should be rotated and the best pattern for rotation. To Maintain tire safety, purchase new tires that are the same size as the vehicle's original tires or another size recommended by the manufacturer. Look at the tire information placard, the owners manual or the sidewall of he tire you are replacing to find this information. "P" indicates the tire is for passenger vehicles. The following three digit number gives the width of the tire in mm. The next set of numbers gives the aspect ration of height to width. "R" stands for radial ply construction. The next number is the tires load index. "M+S" indicates the tire has mud and snow capability.